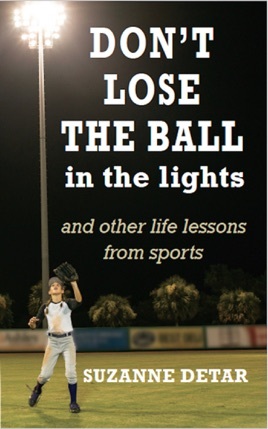 Don’t Lose the Ball in the Lights and other Life Lessons from Sports is the first in the Wiser Today Series. Presented in short, devotion style chapters, the book sends the reader on a journey of learning, self-examination and self-improvement. Each chapter is based on a sports themed story – ranging from basketball to bowling, lacrosse to skiing, dance to gymnastic, and many other sports in between – and covering a wide range of levels – from little league, through high school and college, and into Olympic and professional sports. Each chapter ends with an invitation to consider and self-reflect and leaves the reader a little wiser after each day of reading. Pearls of wisdom, even for the less sports-minded among us! First of all, if you (like me) cannot resist the urge to devour this book once you crack into it, let me suggest reading it a second time as a daily devotional. There are too many smart, insightful nuggets to consume in one sitting alone - each chapter deserves consideration, and application, independent of the other lessons. (Side note: reading at this controlled pace will also leave you time to look up the sports stories referenced in the book - they range from well- to little-known and warrant a deeper dig!). Truthfully, I've never been a huge fan of sports - the value of them has never been lost on me, I was simply not all that interested in athletics beyond high school cheerleading and, now later in life, CrossFit. But as a wisdom-seeking mom of two teenage daughters, this title intrigued me. I was delighted to find that the author, though obviously well-versed in the world of sports, makes the analysis - and analogies - remarkably accessible. The lessons are refreshingly relatable, and many are personal… and funny. Rather than relying on tired clichés or regurgitated idioms, the author offers thought-provoking insights such as, "It's also good to remember that even in the midst of a losing season, there are some plays that do make the highlight reel." Another one of my favorites? "I'm looking for ways and opportunities to metabolize this year's expectations." Oh, and that chapter on muscle memory… I can relate to re-learning how to run, but even more trying to resist falling into "fatigued" thinking. A great read - and re-read.